It’s BACK!!! 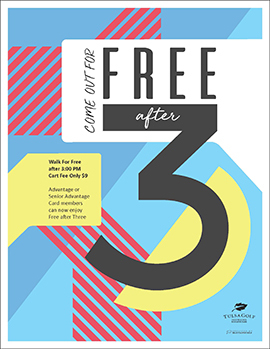 In appreciation of our Advantage Card and Senior Advantage Card pass holders, I’m pleased to announce the return of our popular “FREE after 3” promotion. “FREE after 3” features free greens fee EVERY day after 3 pm, which means you can walk as many holes as you’d like after 3 pm for FREE!! We’ve also have a special promotional cart fee for those wanting get in as many holes as they can – only $9 per rider. This offer is only valid for Advantage and Senior Advantage Card pass holders. We value your support and thank you for another successful year at Tulsa Golf!! Copyright © 2019. Tulsa Golf Courses. Page Belcher: 6666 South Union Ave., Tulsa, OK 74132 | Mohawk Park: 5223 E. 41st Street North, Tulsa, OK 74115.